By way of example come conclusions drawn from a now famous study of Michigan residents exposed to polybrominated biphenyls (PBBs) following a state-wide contamination of fire-retardant in livestock feed. Given stored residues of PBBs (and related polychlorinated biphenyls from industrial coolants) will naturally reduce but half in ten to twenty years, reduction rates from the Purification program proved entirely startling. On the average, those Michigan residents entering the program saw an immediate 20 percent reduction of chemical residues, while four-month follow-up examinations revealed a full 40 percent reduction. That toxic reduction continued well after the program’s completion was also, of course, deemed significant but not unique to the Michigan study. Indeed, a Florida study of a patient exposed to a metabolized variant of dichlorodiphenyltrichloroethane (DDT) found an immediate reduction of 29 percent after completion of the Purification program, with a further reduction of 97 percent approximately eight months later. What such reductions mean in terms of improved health and well-being is obviously variable, and dependent upon earlier exposure to environment toxins. For example, Australian and United States Vietnam War veterans previously exposed to the herbicide-defoliant Agent Orange have reported a truly dramatic relief from persistent skin ailments, headaches, fatigue, insomnia, abdominal difficulties and, interestingly enough, much of what characterizes the Vietnam syndrome in the way of behavioral problems. 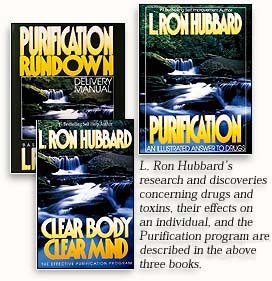 Among other regularly reported Purification program benefits from those exposed to “acceptable” levels of environmental toxins—which is to say, pollutant levels in any modern urban setting—one finds demonstrably improved vitality, memory, concentration and, apparently a consequence of food additives, relief from long-term abdominal/intestinal pain. Less measurable, but no less significant, are the similarly dramatic reports of improved emotional stability and improved mental outlook—all suggesting, of course, that even relatively low levels of toxic residues from atmospheric pollutants and additives may affect behavior. Or to put it more simply, more pointedly: The pollution within our bodies blocks clear thinking. 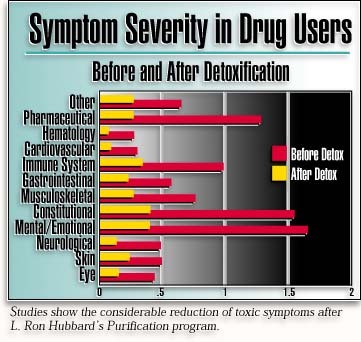 When discussing what Purification program results would seem to indicate regarding toxic deposits and altered thinking, however, one must finally return to a discussion of drugs. As noted, and as shall be further explained in selections from Clear Body, Clear Mind presented here, the impact of drug and drug residues upon our behavior, our perceptions and, actually, the essence of our personality may be quite considerable. For example, among the mass of sociological literature regularly offered up in explanation of post-sixties substance abuse was an obscure 1972 examination of the New York City heroin addict as reshaped through the psychedelic revolution. The central premise, and then a radical one, was this: “A new and different breed of heroin user was living on the streets of American cities.” A descendant of multiple-drug users from 1967 and 1968, this late twentieth-century addict was said to have been wholly indiscriminate, i.e., he would take what he could get from both illicit heroin trade and, significantly, street sales of regularly prescribed pharmaceuticals. In consequence, and this in contrast to earlier portraits of a relatively peaceable addict, he was remarkably violent. Subsequent investigation confirmed it. A principal study of the heroin user in Dade County, Florida found a selection of 517 addicts committing 215,105 criminal offenses through the course of a single year. True, approximately half were “victimless” crimes, primarily prostitution and trafficking. Yet also cited were some six thousand robberies and assaults, more than a few of an extreme and unreasonable nature. A broader multi-city study revealed the same and worse: In any twelve month period 1,002 users committed 95,000 serious crimes, including homicides, robberies, forcible rapes and aggravated assaults. Moreover, a significant number of those 95,000 user crimes were not even in support of habits. Rather, victims were murdered, raped and beaten at random and for no logical reason at all.